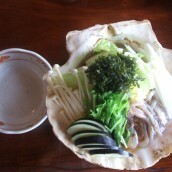 A traditional hako (box) sushi from the northwest area made with fresh water fish. Looks a bit odd, but tastes good. 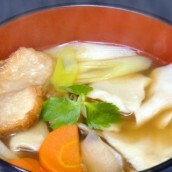 Morokono Hazokuzushi is an old traditional local dish in the northwest area of Aichi Prefecture. 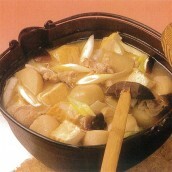 This is a “hare” dish cooked and served for special occasions at home, and it is hardly found at restaurants. Small fresh water cyprinoid fish called moroko is used for the dish, and it looks a bit odd at first, but the taste is quite simple and good. 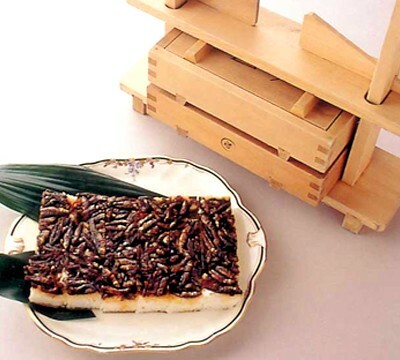 Moroko is cooked in salty-sweet flavor sauce, then put on the top of sushi rice, simmered kakufu and sweet denbu in a layer in a box, and pressed hardly for a while. Then cut into smaller pieces before serving. 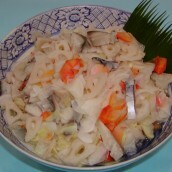 This is a delicacy of Moroko which gives rich salty-sweet flavor and a bit of bitterness in it.